King Harbor The Quest w/ Citra - AoM: Beer et al. 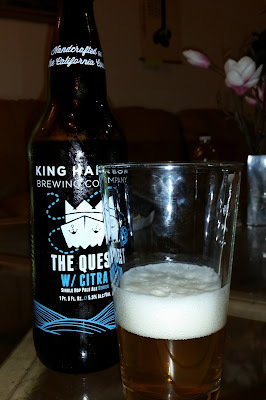 The Quest w/ Citra had a nice grassy smell. Going along with the smell was a hoppy taste. Josh found it super hoppy and didn't like it (Josh dislikes extremely hoppy beers). Michael didn't like it either. Steve, however, said it tasted good and "very orange". 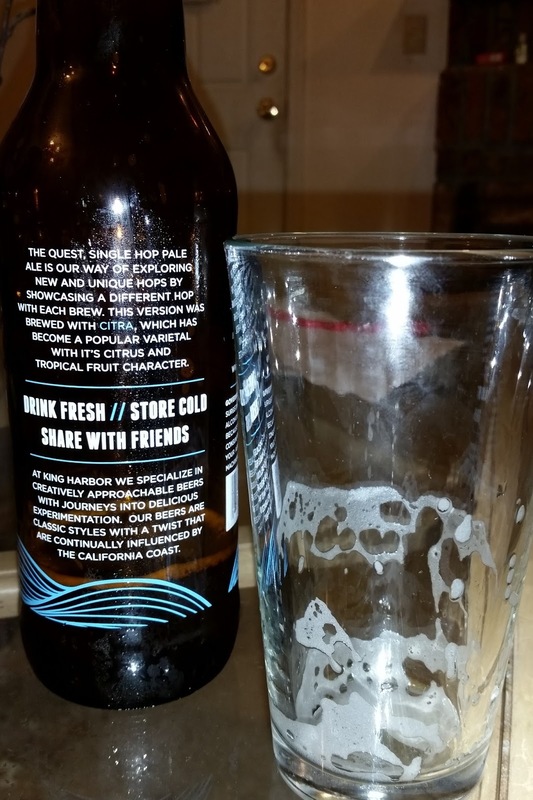 The Beer: The Quest single hop pale ale is a year round release with a rotating twist. While the grain bill remains constant the single hop will change several times through out the year creating a unique experience by showcasing different hop profiles and pairing them with a subtle fruit addition. This is our way of creating a great beer that showcases and emphasizes the awesome flavors of totally radical hops. Note: Appearance may change slightly between beers depending on a multitude of things. Feel free to contact us with questions about a specific version if you want to know why it is the way it is. Enjoy! The Story: This beer is a journey, not a destination. It is the journal of our search for new and awesome hops. There are so many new varieties coming out that it would be a sin to blend them all into hoppy beers and never be able to experience what each one has to offer. This beer could also be easily done as a pilot only for us to personally enjoy and learn from, but we wanted to share this experience with you. Join us in learning about new hops, comparing hop profiles, and ultimately finding out which ones you love. Copyright © AoM: Beer et al.